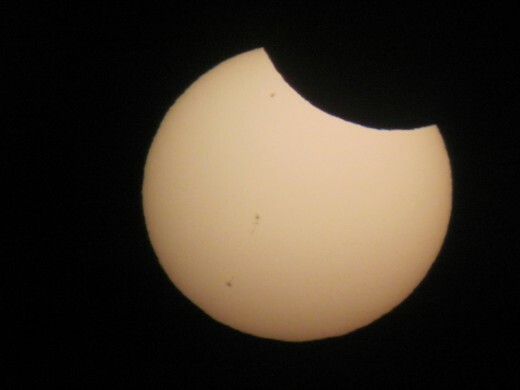 Want to see what the May 20th solar eclipse looked like? Here's my photos plus a few gorgeous photos and videos by far better photographers than myself. 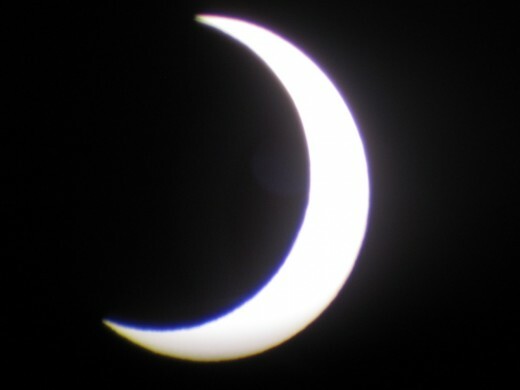 Where I live in southern California, the eclipse was only partial, covering 84% of the sun, but it was still spectacular! My parents saw the full "ring of fire" effect in Utah, but weren't able to get pictures. After my own photos, I've featured a few Creative Commons photos and videos of the annular eclipse from other photographers that are stunning! If you have uploaded any good photos, please share a link in the guestbook. Note: Apologies if my chart got you outside too early! I didn't realize that the Solar Eclipse Calculator App I used to look up eclipse times gives "local times" without factoring in Daylight Savings. Video: Path of Solar Eclipse Across western U.S. 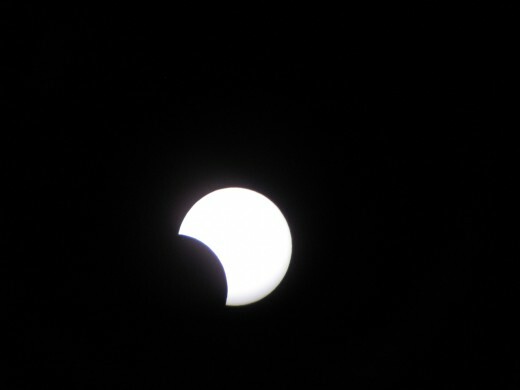 This isn't as exciting as a full solar eclipse, but it was exciting for me. In fact, it was more exciting than expected, because of last minute weather problems. I had planned to view the partial eclipse from the cliffs of Corona Del Mar as the sun set over the ocean. I arrived early, at 2PM, to make sure I had a good spot for the show. As the hours ticked by, the marine haze thickened into clumpy clouds by late afternoon! 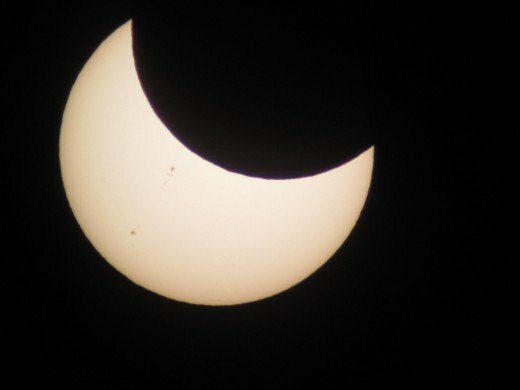 Finally, I bundled up my camera and telescope and filters and rushed inland to the Orange County Great Park, getting set up just in time to see the first "bite" out of the sun. For a homemade filter, I bought a solar mylar sheet at a telescope store, cut a hole in a butter tub, taped the mylar over the hole, and used it to cap my old TeleVue Pronto backpacker telescope. Unlike modern scopes, I have to aim it by hand. I'm not equipped for and don't have any experience with astrophotograpy. So I held a point-and-shoot digital camera over the lens and prayed. The fourth and fifth photos show sunspots, because I was able to fine-tune the camera settings a little, and because the thicker slice of atmosphere as the sun drew near the horizon filtered out a little more glare. 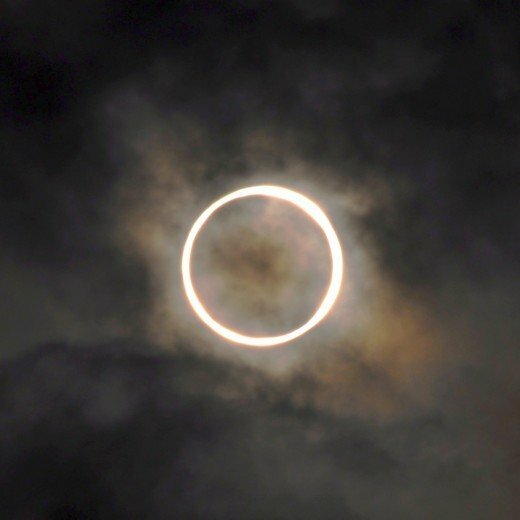 So, What's an "Annular Eclipse," Anyway? A regular eclipse happens when the moon's path causes it to pass directly between us and the sun. 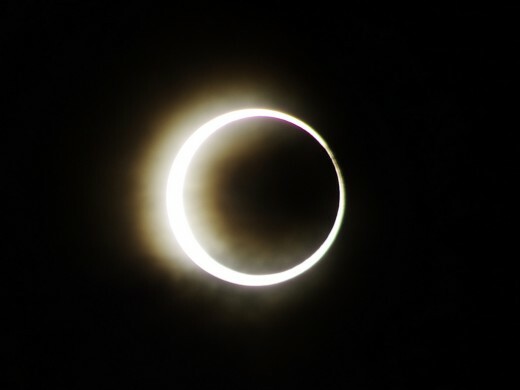 So, what does "annular eclipse" mean? 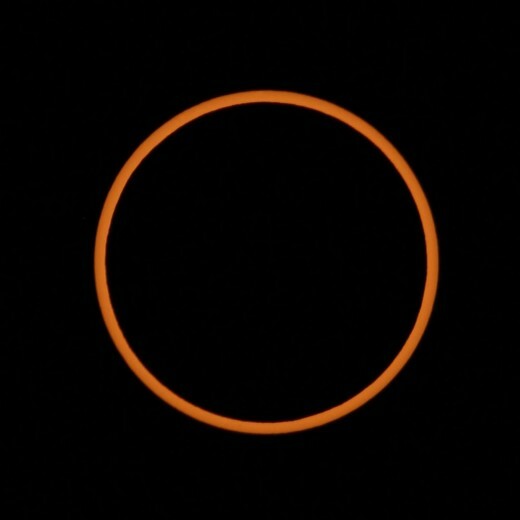 That's a special kind of solar eclipse in which the rim of the sun is visible around the moon in a fiery ring. This happens when the moon is at the far end of its slightly off-center orbit, and appears smaller (from earth) so that it can't cover the whole sun. Annular comes from Latin anulus, "a ring, a circle." 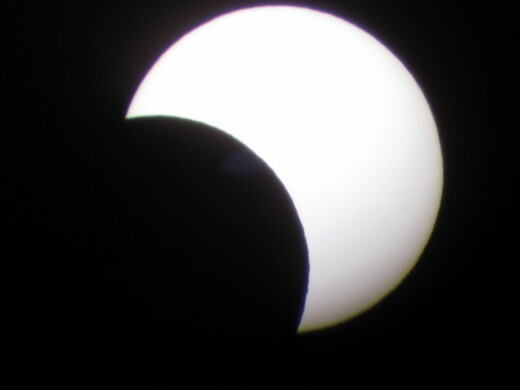 For most places, this was a partial eclipse, meaning that the moon doesn't pass over the center of the sun from our viewpoint, but is off-center, creating a crescent sun. Only places in the direct path of the eclipse saw the full "ring" effect. 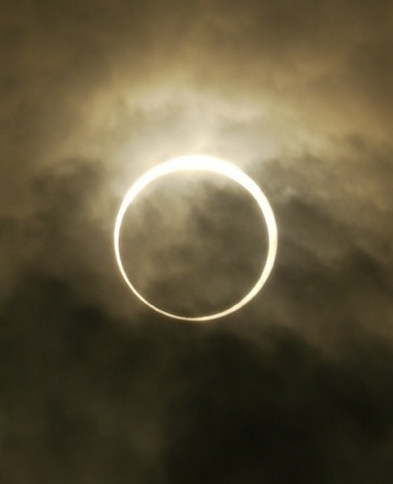 Below are a few Creative Commons photos from Japan showing the annular eclipse. with help from my cat. DO NOT LOOK AT THE SUN, even when it's mostly covered -- you will damage your eyes! Yes, even with multiple layers of sunglasses, you will still damage your eyes! It's not worth it. If you can get to a telescope store, you may be able to buy solar eclipse filters which are safe to use for solar viewing. Otherwise, punch a hole in a stiff card or cardboard. This will create a natural pinhole lens that will focus the image of the sun on any flat surface: the ground, or (better) another piece of cardboard. 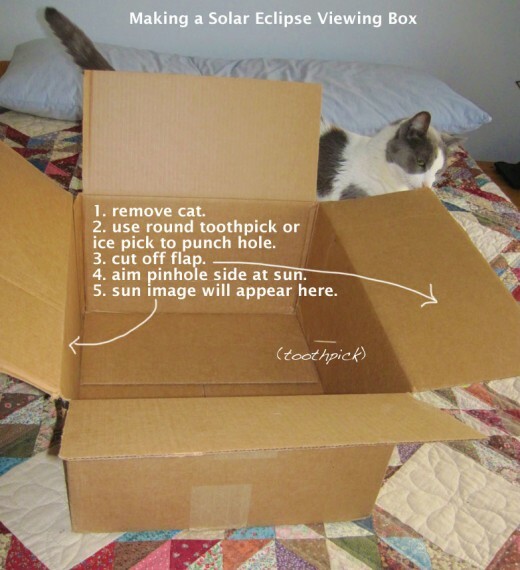 Shoeboxes or shipping boxes are ideal, since the image will appear on the side opposite the hole. Smaller holes make a sharp, crisp image. Larger holes make a larger but less-focused image (you might want to try a hole punch on a piece of cardboard that you can raise and lower until you get the best view.) 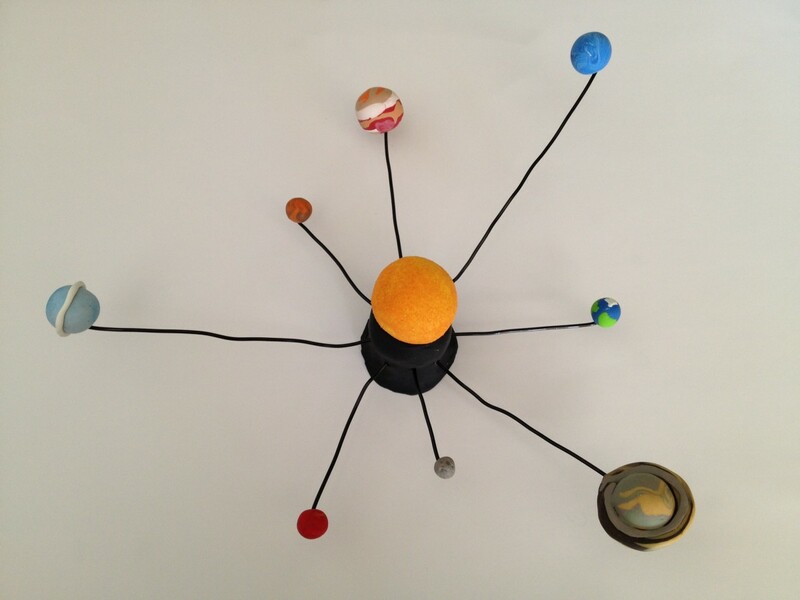 I found that a pencil-sized hole is best for getting a solar disc without it going too fuzzy. 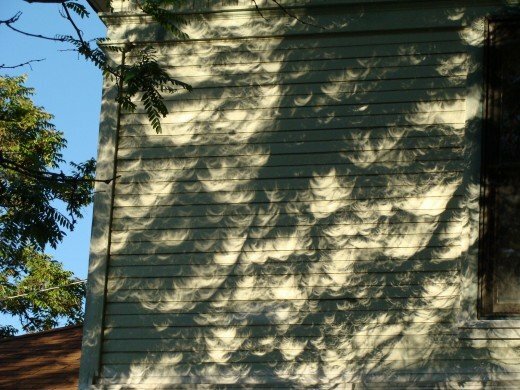 You can even make pinhole lenses with your fingers, creating a fascinating pattern of eclipse crescents on a piece of cardboard! Another fun trick is to have kids prepare a message by punching holes in cardboard or a stiff piece of paper. See this cute example on APOD's (Astronomy Picture of the Day) forum. If you are near trees, be sure to look down. 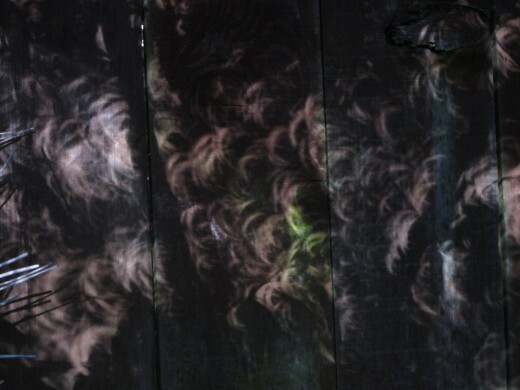 The tiny gaps between leaves create natural pinholes, casting a lovely pattern of tiny eclipses on the ground. Make your pinhole viewers the day before. You don't want to be rushing to create one when it's time. Some people have reported usinh binoculars like a pinhole shoebox to project an image of the sun onto the ground. Don't look through the binoculars at the sun; instead, point them at the sun with their eyepieces aimed at a flat surface. Some cameras can safely look at the sun without damaging their optics, but some will be burned just like human eyes. Photograph at your own risk! 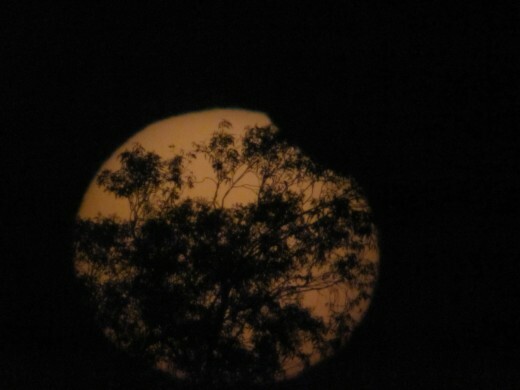 Again, don't look through a camera viewfinder straight at the sun. It IS safe to look at an LCD screen, but again, the sun could damage the camera unless you cover it with a solar filter. Are you going to watch the May 20-21 solar eclipse? 94 people have voted in this poll. This photostream has several more stunning photos from Japan, including glimpses of solar prominences (eruptions). SLOOH SpaceCamera - Watch the Solar Eclipse Live Online! 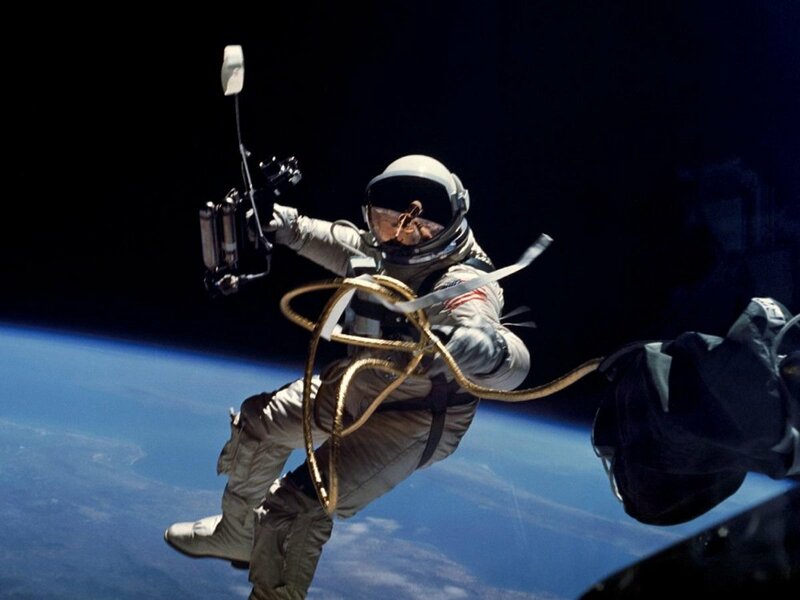 When something's up, SLOOH space camera livestreams it online! Watch the solar eclipse on this website live, even if you're nowhere in the path of the eclipse. Space.com is my favorite site for space news. Times, infographics explaining solar eclipses, and a tutorial on how to make a shoebox pinhole viewer are part of the pre-eclipse coverage; there will be great photos here when it's over. Includes a somewhat technical description. Amazingly, a 2-minute TOTAL solar eclipse will cut across the United States diagonally from Oregon to South Carolina on August 21, 2017. Start making plans now! Google Map of 2017 Eclipse: Zoom in to find exactly where path of total eclipse will be. I remember making one of the pinhole observation boxes when I was a teenager. It was amazingly cool to see an eclipse occur. Sadly, I didn't have a chance to watch this most recent eclipse. Thankfully with the Internet, I can still see some amazing pictures of it. Thanks for the excellent hub! I checked, we're supposed to see a partial eclipse here out east in 2013. I hope I'll still be out east when that happens. It's an awesome event, if not a dangerous one. Thank you for posting the great photos! You got to see a lot more of it than we did. We were warned that we would see only a tiny bit here in Arkansas, and rushed outside as soon as it started. As soon as I grabbed the camera and ran outside, thick, heavy clouds covered the sun. No rain, just annoying clouds. It was a real disappointent, especially when the news didn't run but one photo. Voted you up, interesting and beautiful! Abby: Thank you! Now I'm wishing you could see one. Your comment reminds me of the Ray Bradbury short story "All Summer In a Day" imagining life on a planet where the clouds only clear once every 7 years, and seeing the sun is a very rare event. It's sad for those who miss it. Maybe there's an eclipse due in your area in the future. Check out NASA's eclipse calculator -- http://eclipse.gsfc.nasa.gov/JSEX/JSEX-index.html -- just in case. I would have given so much to have been there. 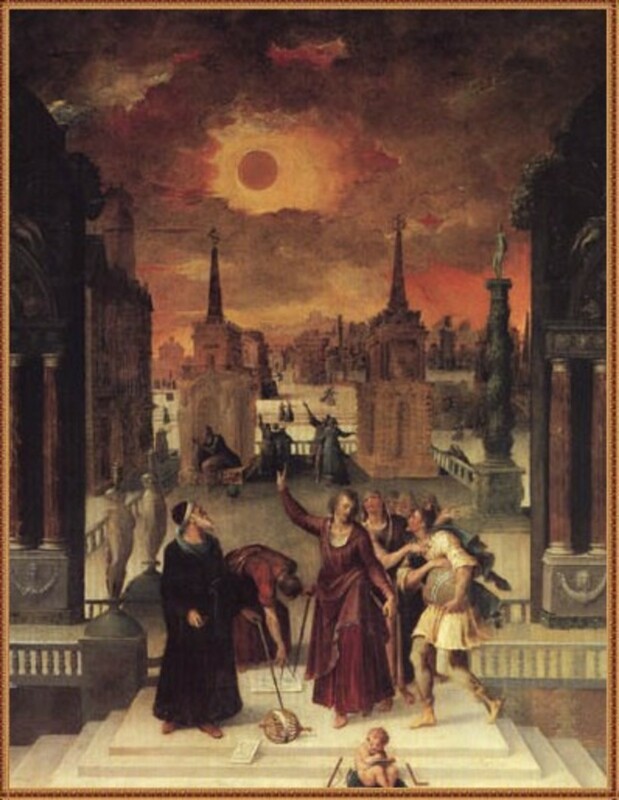 The last time I was in the 'presence' of a solar eclipse I was about 8. That's 29 years ago. And that day..of course it rained. Oh well. Thanks for sharing! The pics are impressive, as well as the vids. It's cloudy on my side of the island (windward Oahu) today, so I wouldn't have seen it anyway. Bit late to comment on this now, but it was useful of you to provide this guide to the path of the annular eclipse. 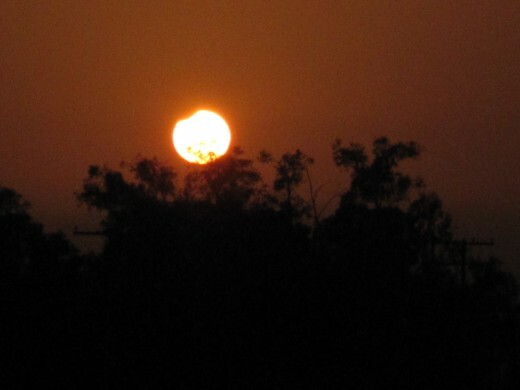 I had considered flying to America for a holiday in the Grand Canyon area to see this eclipse, but it wasn't possible. I've seen total and partial eclipses, but never an annular eclipse. Oh well. One day. Heard about this yesterday, So excited you wrote this descriptive hub. Thanks, I have a shoe box in the closet to punch a hole in then will muster the troops to watch this specular solar event. PWalker: yeah, I was surprised: I thought for sure that Hawaii would get a good look, since the eclipse path hits California and Japan, but orbits cross the map in swoops instead of straight lines. Someday I need to sit down with a globe and try to understand why that happens. I was wondering if I'd be able to see it since Hawaii is that far from Japan, but the viewing path dips north of Hawaii. Oh well ... guess I'll have to watch it via video stream. Thanks for this informative hub and the instructions on how to make a viewing box. Voted up, useful, and interesting. I live in Albuquerque, New Mexico and I cannot wait for the eclipse! Vote up! Note the website I listed above that will be broadcasting the solar eclipse in a live video stream. Not quite like being there, but at least it'll be visible to everyone in some form! Well, that's just the coolest thing ever! I won't get to see it, but I'll just have to watch it on TV. Thanks for posting this informative hub. The video was amazing, too.